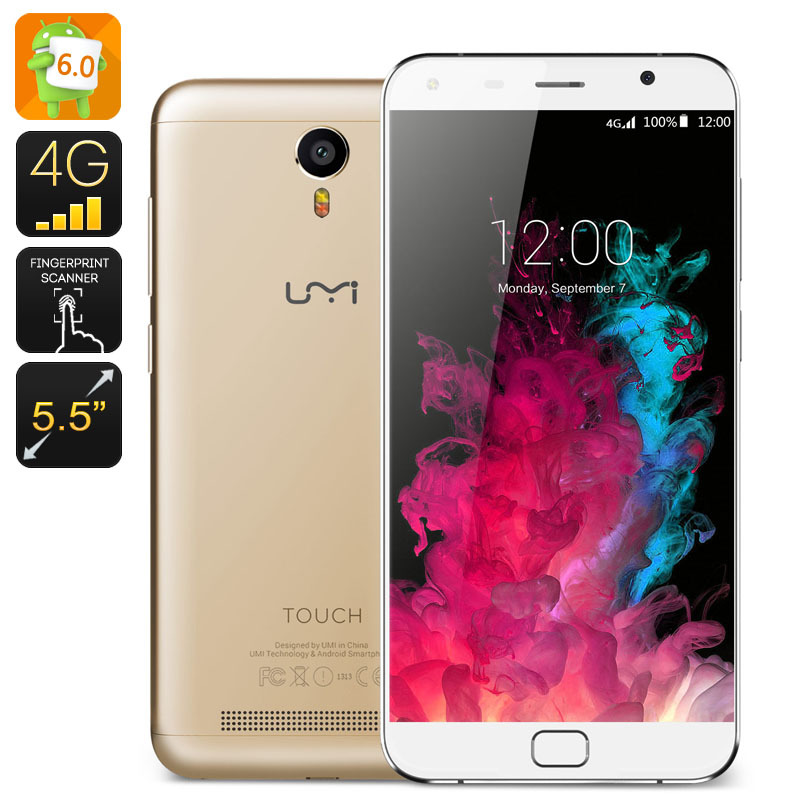 Successfully Added UMi Touch Smartphone - Android 6.0, Octa Core SoC, 3GB RAM, Dual SIM 4G, 16GB Memory, 128GB SD Support, Smart Wake (Gold) to your Shopping Cart. With and Octa Core CPU, 3GB RAM, Android 6.0 Marshmallow OS and 5.5 inch 1080P screen the unibodi UMi Touch packs in all the features your could need at an incredible price. Powered by an MTK6753 SoC and 3GB of RAM the UMi Touch offers a stunning performance. This is enhanced even further by the Mali T720 GPU so it can handle all the gaming action and multitasking you desire without dropping a frame. The 5.5 inch display boats a 1080p resolution which works out a 400PPI, this means you get a crystal clear sharp image and makes movies a joy to view on this Smartphone. With 16GB of built in storage and the option to add up to 128GB more via the micros SD card you can enjoy all the latest films and games with plenty of space to store them. boasting the new and improved Android 6.0 Marshmallow OS this UMi Touch is one of the first android 6.o phones out of China and brings plenty of new features and improved customization allowing for stream lined navigation. you also benefit from Smart wake and ?Gesture control for great navigation of apps and features. Incorporating the advanced p0rotection of biometrics this UMI Touch Smartphone has an a front facing fingerprint scanner so only you can unlock it. this keeps all your data safe and secure but lets you access it with just a tough whenever needed. There is the option to use two SIM cards on this Smartphone and each slot supports 4G so you can run with dual standby and receive calls from each SIM card through the day, easily partitioning your work and private contacts while letting you effortlessly manage them on the one phone. With 4G connection speeds you can even enjoy streaming of HD video content allowing you to keep yourself entertained on those long commutes with your favorite shows and movies. The UMi Touch has a substantial 4000mAh battery that offers as mcuh as 24 hours usages when surfing the web and up to 156 days in standby. Charging in just a few hours you will be able to go days on end without needing a recharge. more than enough for even the busiest of schedules.. The Android 6.0 UMi Touch 5.5 inch Smartphone comes with a 12 months warranty, brought to you by the leader in electronic devices as well as wholesale Android Phones..